Come join us this Valentine's Weekend! 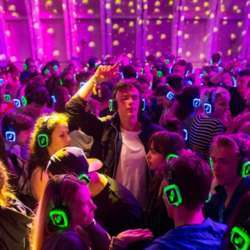 This year, the Silent Disco is taking over the atrium space of the stunning Protected content . There will be 3 DJs playing simultaneously and party-goers are able to flick between the different channels on their individual headsets, with a selection of the latest chart-topping pop grooves on the green channel, bumping electronic house and EDM music on the blue channel, and sing-along rock and indie anthems on the red channel. Whatsapp me after you purchase the tickets. Meeting information will be shared in the Whatsapp Group.